Jeremy Wood documents miles-long renderings by using Global Positioning System. These GPS drawings bind the arts and sciences by using languages of drawing and technology to present a topographic memory, by his words a “personal cartography”. Wood’s artworks in Re-Drawing Boundaries online exhibition introduce new approaches to travel, navigation and local awareness. Jeremy Wood specializes in public artworks and commissions with an original approach to the reading and writing of places. His work is exhibited internationally and is in the permanent collection of the London Transport Museum, the V&A, and the University of the Arts in London. His art has also been featured book such as Else/Where Mapping, and Mapping London, and in publications such as the Cartographic Journal, New York Times, and Artforum. He has conducted numerous GPS drawing and mapping lectures and workshops in schools, museums and galleries and continues to make drawings and maps of his daily travels with GPS. For over ten years he has been exploring GPS satellite technology as a tool for digital mark making on water, over land, and in the air. Recently he drew a map of the University of Warwick campus titled Traverse Me that included the cartouche and the scale amongst the intricate GPS tracks and gave a unique reading of the accessible landscape. 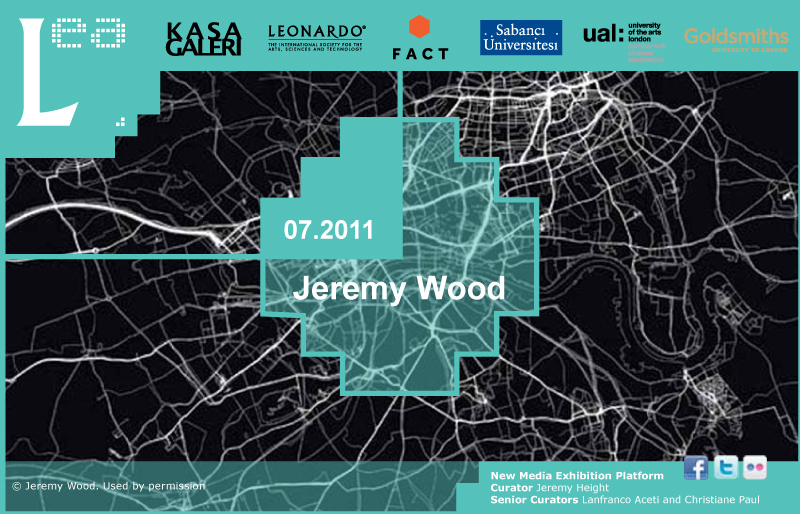 In London in 2008 he exhibited a collection of slit scan photographs inspired by perceptual distortions of travel. His works with film and video projects present aspects of time and identity through animation and portraiture. Wood was born in San Francisco in 1976 and grew up in Berlin and England. He holds an MA in Fine Art from Central Saint Martin’s in London and a First Class Fine Art Degree from the University of Derby. He is currently based somewhere between his studios in Oxfordshire, England and Athens, Greece. White Horse Hill, 2002, Jeremy Wood. A documentary by Jeremy Wood and Hugh Pryor showing the making of a 1:1000 scale model from GPS tracks. The model is composed of forty three kilometres of methodical walks that are represented by the edges of the sculpted cardboard. Star Flights GPS Drawing, Jeremy Wood. Video slit-scan photography of a 5414 mile GPS drawing in the shape of a star. Five flights over Europe, from England to Poland, Spain, Sweden, Italy, and back to England.